It seems natural to strike up a conversation with taxi drivers when I trip from home to the airport or from the train station to my daughter’s place in the city. In Chicagoland most taxi drivers are from Nigeria, Mexico, India/Pakistan and sometimes from Mongolia, Assyria, or Ukraine. They are always interesting with vivid backgrounds and opinions. We’ve talked politics, religion, but the best common ground is talk about food. Everyone likes to recall his culinary heritage, and showing an interest in different foods brings a feeling of goodwill. I remember asking a young Nigerian driver if he had any news about the kidnapped schoolgirls. This subject led us his telling me about his early years, and he followed with a most profound statement: “I’m Christian because I grew up in a Christian home, but my wife is Muslim because she grew up in a Muslim home.” Our foundational years shape our future lives. . . As equally profound did we grow up in a rice eating culture or one based on wheat? Outside of our current food fads, the world is divided along lines of rice vs wheat; butter vs olive oil; spices vs bland. I’ve dipped into many mini travels in my taxi rides as I’ve heard about the place of horse meat in Mongolia, buckwheat in Ukraine, fufu in Nigeria or biryani in Pakistan. Everywhere there’s the magic seduction of rice. The great pilafs and pulaos of Persia, the congees and sushi of Asia, risottos, paellas of Europe and the simple comfort of a rice pudding at home. When I was younger, I only knew rice as Uncle Ben’s, but travel has encouraged me to add numerous rice varieties to my pantry. Basmati is consistently the favorite and each time I dip a cup into the bag of rice I’m led into a routine that takes me on a journey and reminds me of interesting stories I’ve encountered along the way. I sat beside Mrs. Singh as she swirled rice in cool water, rinsed it and set it to soak. I breathed in the fragrance of steamed rice, cooling to fluff. I waited patiently to pull a tuft of sticky rice into a ball to dip into a spicy goat stew. Even now rice cooking always follows a pattern. One of our most ancient grains, rice, like wheat, grew wild for millennia before it was first cultivated in Asia. Still with us today, let’s not forget how good it is. I’ve developed the following recipe over years. 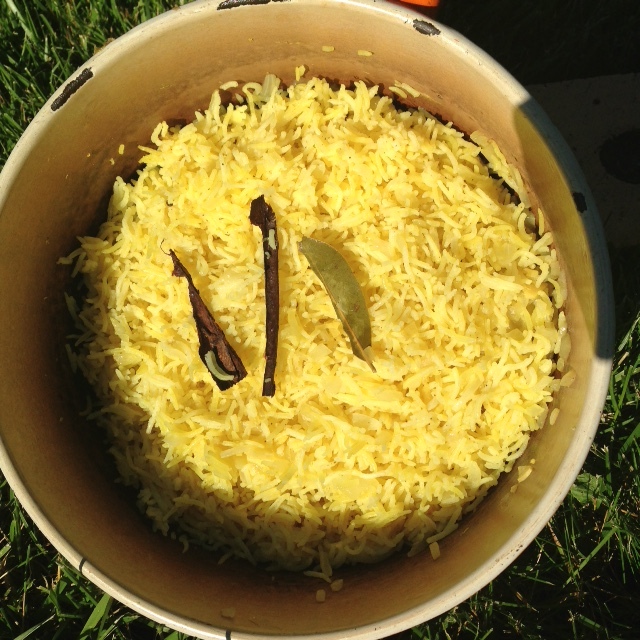 It uses a traditional Indian rice ritual and can be multiplied for large groups or used for a small family dinner. It holds well, reheats easily and is even good at room temperature as part of a salad. It’s just a bit more than plain steamed rice and so delicious, it’s tempting to eat a bowlful. Place rice in a deep bowl; cover with cool water and swirl gently with fingertips until water grows cloudy. Pour off water and repeat rinsing process twice more. Cover rinsed rice with cool water and soak while preparing base. Melt butter and oil in a heavy pot with tight fitting lid. Add cinnamon stick, coriander and bay leaf, along with chopped onion. Sauté gently until onion is translucent. Add turmeric, garam masala and salt. Drain rice reserving 1 1/3 cups soaking water. Shake soaked rice in strainer to remove excess water; tip rice into sautéed base. Stir to combine with seasonings. Add measured water, stir again making sure all grains of rice are covered with water. Cover, bring to a boil, reduce heat to low and simmer 10 minutes. Turn off heat (remove from burner if electric) and steam at least 10 minutes. Fluff with fork before serving. Place towel over top of pot and replace lid to hold. Serve with grilled meat, fish or vegetables, nicely sauced chicken or just by itself with a green salad. Enough for 4-6. You are currently browsing the Mary Jo's Kitchen blog archives for June, 2016.